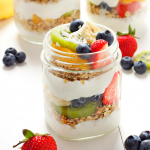 These Tropical Fruit Breakfast Parfaits feature fresh fruit, healthy homemade granola, and delicious yogurt for the perfect easy breakfast or snack! Wash and slice all the fruit you'll be using. Add a layer of the Greek yogurt to each of the mason jars. You'll need approximately 1/2 cup of yogurt per parfait, so each layer should be approximately 1/4 cup of yogurt. Add a layer of the granola to each mason jar, and then add a layer of the sliced fruit, arranging it to your liking. Add another layer of yogurt, another layer of granola and then top each parfait with the remaining sliced fruit and the shredded coconut. Enjoy immediately for a fresh, healthy breakfast treat!